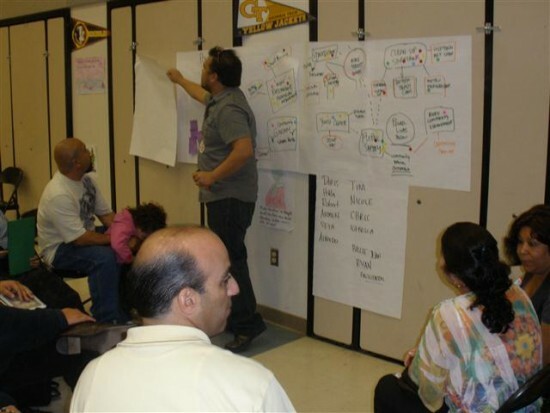 Just an hour after this morning’s Los Angeles Neighborhood Dreams Initiative (LAND) Summit for Echo Park and Historic Filipinotown, The party moves west to East Hollywood’s Kingsley Elementary School, where about 20 community members came to participate in CD13’s series of community visioning workshops. As with the last meeting, I was tasked with Tweeting the play-by-play at this session, but I wore the active participant hat as well. What Council District 13 considers “East Hollywood” is a much larger area than what the East Hollywood Neighborhood Council delineates it to be. People from neighborhoods as far west as Santa Monica and Western, to as far south as Ambassador Hill (the area surrounding Beverly Blvd between Vermont and Normandie) to as far east as Rampart Blvd. Despite such a large area, there was the smallest turnout thus far (I blasted the event to the EHNC’s contact list and local schools, although I had gotten the registration link just days before the event, and the Summit’s date, originally scheduled for April 2, was moved to May, then moved back to April 2 — thus the confirmation of the event’s date was also relatively late). But despite such a relatively small group, we had the most diverse, and probably the only one that more closely matched the area’s demographics: Roughly half of the participants were Latino, with a good representation of Armenians, Asians and whites (in fact this was the only LAND workshop this far where whites represented a small minority). But even more noteworthy was that despite this meeting actually encompassing a number of defined neighborhoods, our needs and issues were pretty much identical throughout the group; it was almost as if we were one community. CD13 field deputy Ryan Carpio lists community needs from the East Hollywood crowd. CD13 field deputy Angela Motta takes down community wishlist items from our breakout group. 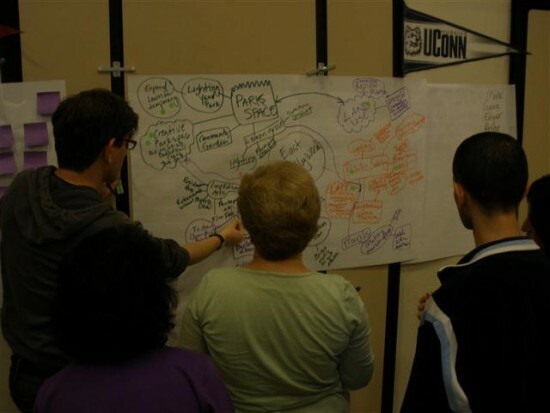 We only had two groups, one facilitated by Ryan Carpio, the other by Angela Motta. I was in the latter with fellow E-Ho locals, people from Ambassador Hill, Melrose Hill and Rampart Village. Despite the geographically-scattered neighborhoods represented here in the “East Hollywood” summit, we pretty much came to a consensus on what our community was: diverse, centrally-located, small business-oriented. A multi-modal, historic community with a great variety of restaurants and great institutions like L.A. City College and Barnsdall Art Park. Even more noteworthy was that our vision wishlist items for our community, aside from specific locations, were basically the same. Park space was a big issue; the Bureau of Street Lighting maintenance yard on Santa Monica Blvd. was brought up. But since that was a long-term project beyond the scope of the LAND summits, I suggested we take the existing green space at the light yard and double it somehow for community use. I also brought up creative uses for recreational space, such as setting up a temporary basketball court at the Cahuenga Library parking lot during days it is closed. Community gardens and farmers markets were also items the group wanted to have. Mark Flores from the Rampart Village Neighborhood Council – whose community is some three miles to the east – brought up the need to have an LAPD drop-in center, especially since the Rampart Division left their neighborhood for a new location closer to Downtown. We also needed one here in East Hollywood, close to Santa Monica and Normandie, where the Rampart, Northeast and Hollywood police divisions intersect (there is one planned, at the Mariposa Place Apartments on Santa Monica Blvd, but we keep hearing conflicting reports whether it will happen or not). 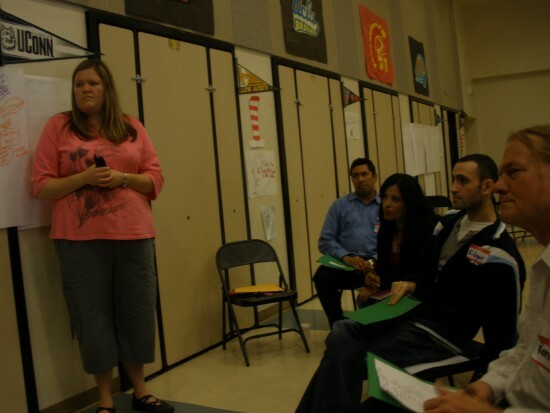 Emergency preparedness was also an important issue in our group, especially since the neighborhood is home to three large medical centers, and can use local schools, including LACC, as potential shelter sites. East Hollywood being an area of a high transient residential population, with people moving in and out constantly, I recommended the need for “Community Education” – everything from calling 3-1-1 to properly disposing of one’s bulky items, to how to improve and respect one’s own community. That was expanded by others in the group by having linkages between the schools and nearby arts institutions, such as the Pantages Theatre. 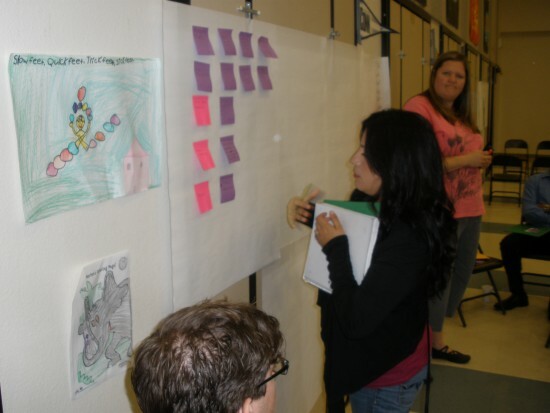 Public art was highly valued by the group, and many wanted to see more murals. 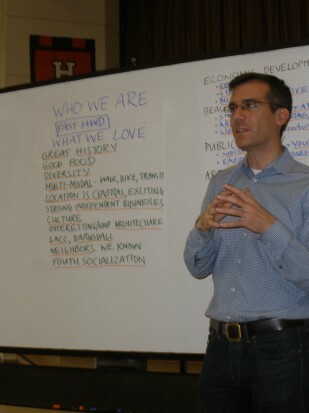 At the end of the session, Garcetti gave the summary of the visioning workshop. He acknowledged that although we had a smaller group, we were more focused and specific on certain things we wanted to see in out neighborhoods, as opposed to some general needs (cleaner streets, more parking, etc) expressed by some in the previous LAND summits. On that note, with a smaller attendance than other neighborhoods who have hosted a LAND summit, East Hollywood still has a ways to go, and we need to continue with the capacity building. 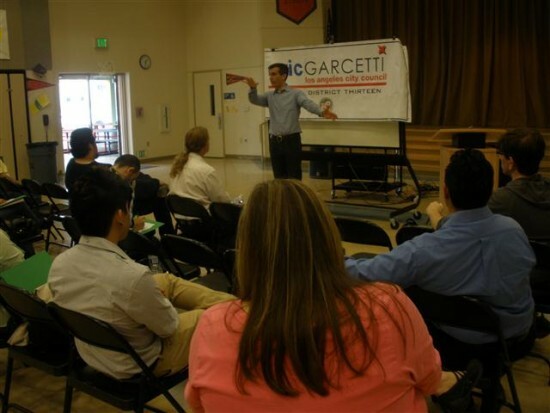 On the other hand, we’ve come a looooong way from being an “unknown community” with no organizations or local identity; I applaud Garcetti for being the first elected official to recognize the modern East Hollywood as a community in the 13th District. I was very glad the council office knew our neighborhood well enough that we warranted our own visioning summit, as opposed to lumping it in with (central) Hollywood. I do plan on being on two LAND steering committees, for East Hollywood and Historic Filipinotown. I’ll be following up with any LAND-related activities on this blog. Stay tuned!